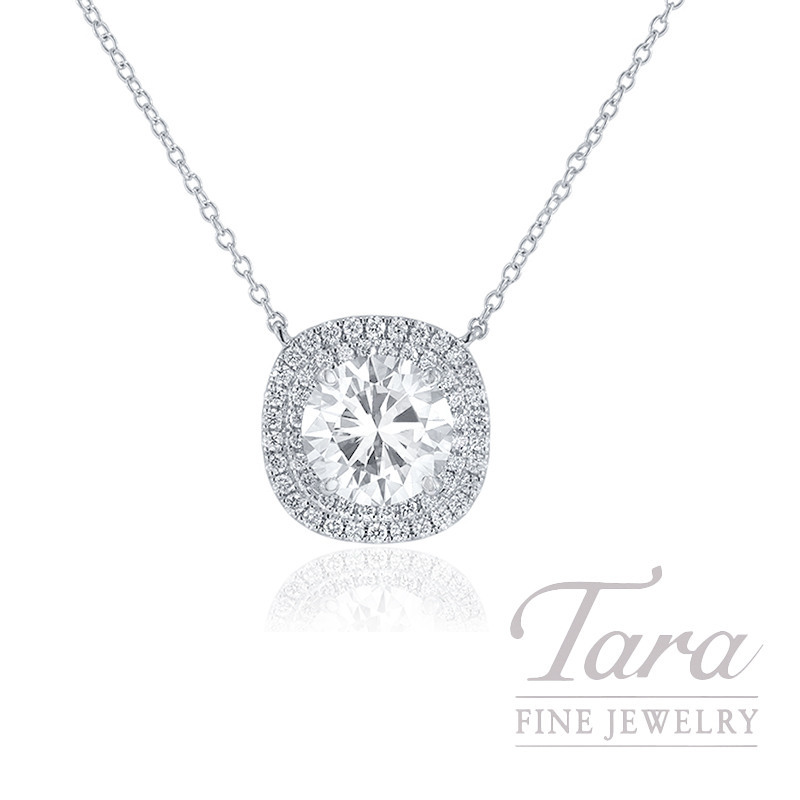 At Tara Fine Jewelry Company, we are Atlanta Jewelers specializing in Designer Jewelry and the most beautiful Diamond Necklaces in Atlanta. Fall in love with the unforgettable brilliance of this immaculate A. Jaffe 18k White Gold Double Halo Necklace now featured at your Atlanta Jewelry Store - Tara Fine Jewelry Company. Home to the most beautiful Diamonds and Diamond Necklaces in Atlanta, Tara Fine Jewelry Company is proud to present this outstanding A. Jaffe Necklace featuring a glittering double halo and of course a breath-taking center Diamond. Enjoy the shimmering sparkle of 18k White Gold and the twinkling beauty of 54 round dazzling Diamonds at .30TDW in the stunning Double Diamond Halo. This exquisite glimmer of light perfectly accents a wondrous 2.28CT J-VS1 Round Brilliant Center Diamond (sold separately). Paired with a 18" chain, this extraordinary A. Jaffe Pendant and beautiful 2.28CT Diamond creates a glorious Diamond Necklace that you'll never want to take off! At Tara Fine Jewelry Company you will find the best selection of Designer Jewelry and Engagement Rings Atlanta has to offer, as well as the finest collection of luxury watches. As the authorized Rolex Atlanta dealer, we feature the largest inventory of Rolex watches in Atlanta and specialize in Rolex repair and service. Stop by today and marvel at our amazing assortment of high quality jewelry and luxury Swiss-watches. Tara Fine Jewelry Company – 3 miles from the Mall of Georgia; miles away in customer service!